If you're off to fight crime, then you better be equipped. Because, you know, the bad guys won't play fair. They'll ambush you. Try to sneak away. Cheat. So you'll need to be prepared for just about anything. And for the Batman team? That means some killer gadgets to get you out of sticky situations. For instance. Both Batman and Batgirl have spiked gauntlets. Great for catching weapons, inflicting a little damage, and looking rather intimidating. 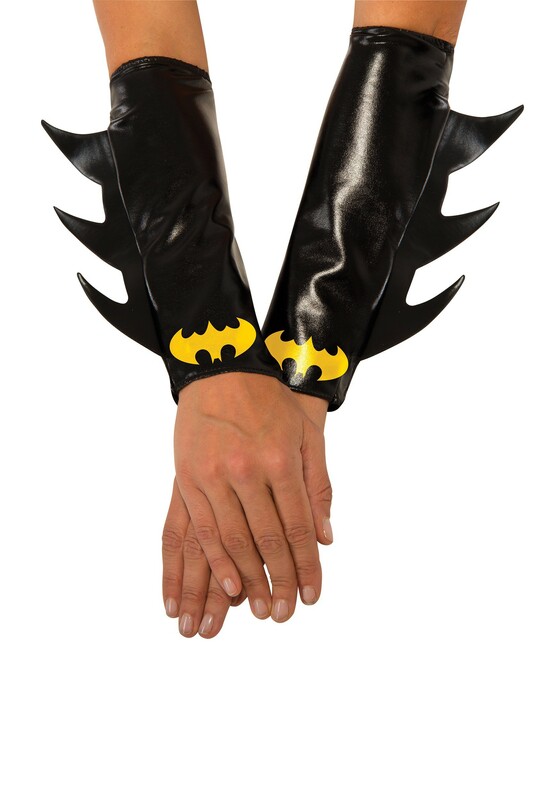 So if you're determined to try your hand as a crusader of the night, you'll need a pair of these Batgirl Gauntlets for sure. They're shiny black with the yellow Batman symbol and those scary bent spurs. They're sure to help deter those baddies... hey, isn't that the Bat-symbol? Don't you have work to do?